Die Lunæ, videlicet, 18 die Julii. Earl of Warwick's Letter to the Speaker, complaining that he is proclaimed Traitor for obeying the Parliament, and desiring a Supply of Victuals for the Fleet. Persons attached at Lincoln, by Warrant from the King, for exercising the Militia there. Lord Mayor to be brought To-morrow. Treasurers to pay 10,000l. to the Garrison at Hull. Captains Mowyer and Pigott to be rewarded. Some Ordnance to be sent back to Hull. Captain Horner to be released. Lord Brooke to take Forces, to defend the Warwick Magazine. Letter from the Committee at Hull, to the Speaker of the H. C.
Sir John Hotham's Letter to Sir Philip Stapleton. 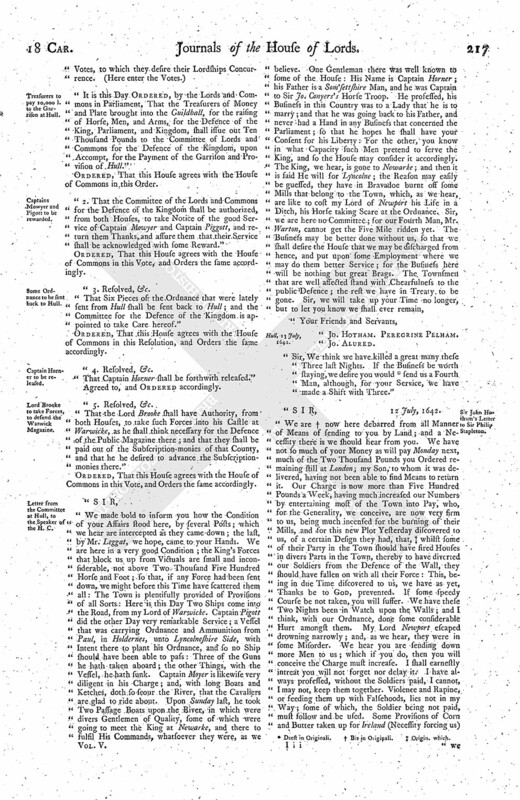 Affidavit of the Orders of Impeachment being left with Mr. Hastings, Sir John Bale, and others. Next, a Copy of a Letter was read, which he sent to the King, 5 July, 1642. Next, the Answer to the Earl of Warwicke was read, written by Mr. Secretary Nicholas, from the King, 13 July, 1642. Mr. Waters's Letter to Mr. Slyngsby. I wrote to His Majesty, upon His sending me my Discharge from the Command of the Fleet (a Copy of which Letter I send your Lordship here inclosed), and sent it in a Letter to Mr. Secretary Nicholas, to desire him to deliver it. I send your Lordship likewise his Answer, wherein your Lordship may see, that obeying the Parliament is counted High Treason; a Doctrine I never heard of till this Parliament. I hope your Lordship will have a Care that we be supplied with Victuals and Necessaries for the Fleet; and I make no Doubt we shall do our Parts, to make His Majesty and all the World see we desire nothing more than His Protection, and His Parliament and Kingdom's; for which End we were set out to Sea, and to which End all our Aims and Actions shall tend, to the last Drop of our Bloods. Our Victuals spend apace, and the Merchants Ships were entertained for Six or Eight Months, but were to have Warning at Five, if for Eight Months; this Month that Warning must be, that they may provide themselves for it: Therefore I desire to know the Parliament's Pleasure in it speedily, and that (fn. 1) they would take Order with Mr. Greene, the Chairman for that Business, to give them Warning from the House of Commons, and to provide speedily Victuals for us, and Money, which we hear not of yet. I send your Lordship here inclosed a Letter, which I intercepted going to Captain Slyngsbie from his Lieutenant Waters; your Lordship may see what Advices they give one to another. I shall send Captain Slynsgby and Captain Wake up to the Parliament, as soon as I get Opportunity by Sea; since by Land the Sheriffs hath refused to assist Mr. Maxwell's Deputy, according to your Order. From abroad The James, in The Downes, this 17th July, 1642. Ordered, To be communicated to the House of Commons. To deliver to the House of Commons the Letters received from the Earl of Warwicke; and to desire a Conference, touching a Warrant of His Majesty's, sent into Lyncolneshire. Whereas We are credibly informed, that Wm. Watson, Alderman of Our City of Lyncolne, and Ames, one of Our Sheriffs of Our said City, have, by the Colour of a Warrant and Direction from the Lord Willoughby of Parham, (fn. 2) or otherwise, put in Execution the pretended Ordinance of Parliament concerning the Militia, contrary to Our express Command, declared by Our late Proclamation; We do therefore hereby expressly charge you to make your immediate Repair to the Place of Abode, or to any other Place where you shall understand of the present being of the said Watson and Ames, whom you are to apprehend, and bring in safe Custody before Us, or Our Privy Council, to answer their Disturbance of Our said Command; willing and commanding all Our Sheriffs, Mayors, Bailiffs, Constables, Headboroughs, and all other Our Officers and loving Subjects whom it may concern, to aid and assist you in the due Execution of this Our Warrant, as they tender the Peace of Our Kingdom, and will answer the contrary at their Perils; and for so doing, this shall be to them and you a sufficient Warrant. "Given at Our Court at Beverly, 9th July, 1642." To desire a present Conference, if it may stand with their Lordships Conveniency, touching the Safety of the Kingdom. That this House will give a present Conference, as is desired, in the Painted Chamber. Ordered, That a Warrant be sent to the Lieutenant of The Tower, to bring the Lord Mayor of London to appear before the Lords in Parliament, To-morrow Morning, at Nine a Clock. 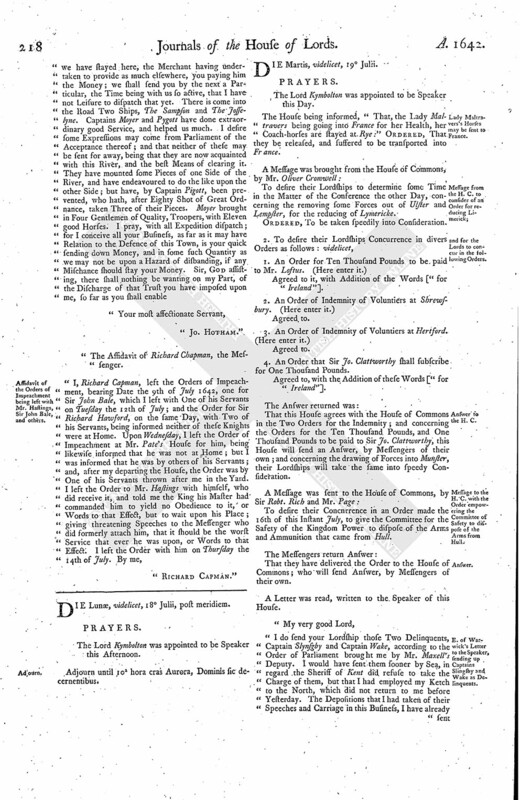 "It is this Day Ordered, by the Lords and Commons in Parliament, That the Treasurers of Money and Plate brought into the Guildhall, for the raising of Horse, Men, and Arms, for the Defence of the King, Parliament, and Kingdom, shall issue out Ten Thousand Pounds to the Committee of Lords and Commons for the Defence of the Kingdom, upon Accompt, for the Payment of the Garrison and Provision of Hull." "2. That the Committee of the Lords and Commons for the Defence of the Kingdom shall be authorized, from both Houses, to take Notice of the good Service of Captain Mowyer and Captain Piggott, and return them Thanks, and assure them that their Service shall be acknowledged with some Reward." "That Six Pieces of the Ordnance that were lately sent from Hull shall be sent back to Hull; and the Committee for the Defence of the Kingdom is appointed to take Care hereof." Ordered, That this House agrees with the House of Commons in this Resolution, and Orders the same accordingly. "That Captain Horner shall be forthwith released." Agreed to, and Ordered accordingly. 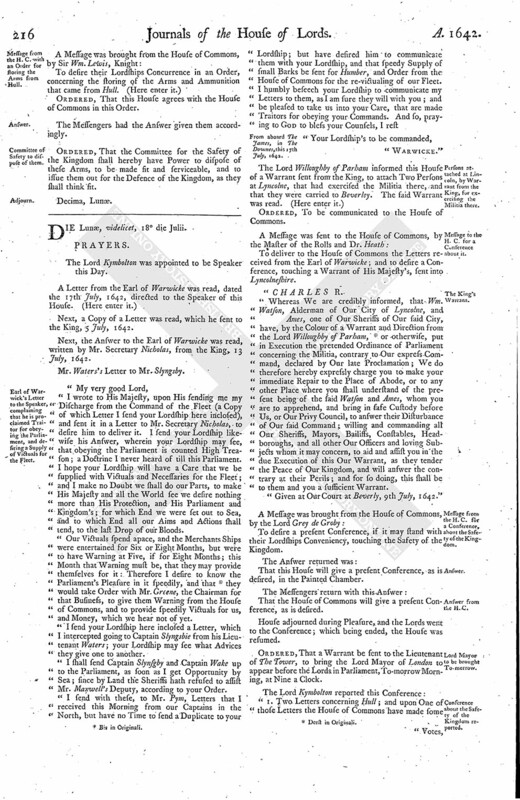 "That the Lord Brooke shall have Authority, from both Houses, to take such Forces into his Castle at Warwicke, as he shall think necessary for the Defence of the Public Magazine there; and that they shall be paid out of the Subscription-monies of that County, and that he be desired to advance the Subscriptionmonies there." "Sir, We think we have killed a great many these Three last Nights. If the Business be worth staying, we desire you would (fn. 3) send us a Fourth Man, although, for your Service, we have made a Shift with Three." The Affidavit of Richard Chapman, the Messenger. Adjourn until 10a hora cras Aurora, Dominis sic decernentibus.